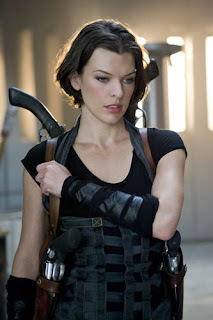 Kryptonian Warrior: Resident Evil 5: Retribution? Milla Jovovich Tweeted some info on the newest installment of the Resident Evil movie franchise this week stating that the 5th film could be called "Retribution". The rest of her Tweeted info is below. "I think its called RE: Retribution, but i have to ask paul 2 b sure." "I pray 4 japan everyday and i can't wait 2 go there and shoot the nxt RE!" "jst 2 let the RE fans know, cause there's been a bunch of questions abt the nxt film, paul has kids that are proffessional players...so he's literally watching days of the most awesome RE players out there to get inspiration 4 the nxt installment of the franchise." Can we stomach a 5th film? Will they try and reach the amount of sequels the Saw franchise rose to? Who knows. I still watch them regardless!